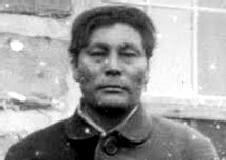 Swift Runner was a Cree Indian who lived during the last century in what is now central Alberta. His background seemed not unusual. As a young man he received a solid useful Cree education; he married and had a family of six children; he traded with the Hudson's Bay Company; and, in 1875, he served as a guide for the North West Mounted Police. But Swift Runner's life ended in tragedy and notoriety. During the winter of 1878-79, a time of starvation and misery for the Cree people, he became possessed by the Windigo psychosis (an aberration characterized by grand delusions and cannibalistic impulses that anthropologists have identified in several Canadian Indian cultures). He murdered his wife and family and cooked and ate their flesh. Eventually he was arrested, brought to trial, and in December, 1879, hanged at Fort Saskatchewan. win’-di-go n. a spirit believed by the Algonquians, Cree, and Ojibwas to take possession of vulnerable people, causing them to engage in cannibalism and other forms of antisocial behavior. When the story ran in the quarterly Old West, I accompanied it with an image from the collection of the Glenbow Museum. It showed Swift Runner with a scowling Mountie in pillbox hat. I’ve always found this photo of Swift Runner unsettling. During the winter, a Windigo ate Swift Runner’s family. Swift Runner was a Cree hunter and trapper from the country north of Fort Edmonton. He was a big man, over six feet tall, and well liked. He was mild and trustworthy, a considerate husband, and very fond of his children (a little too fond of his children, as events proved). All of these traits endeared him to his people and to the traders of the Hudson’s Bay Company. But this was not enough to allay suspicion when he returned from his winter camp in the spring of 1879 without his wife and family. When he could not give a satisfactory account of their whereabouts, his in-laws became worried. They decided to tell the North West Mounted Police, who had then been in the West for just five years. Inspector Sévère Gagnon was given the task of investigating Swift Runner’s behavior. He and a small party of policemen accordingly trekked out to the trapper’s camp. Swift Runner obligingly showed the Mounted Policemen a small grave near his camp. He explained that one of his boys had died and was buried there. Gagnon and his detachment opened the grave and found the bones undisturbed. That, however, did not explain the human bones scattered around the encampment. Gagnon produced a skull, which Swift Runner willingly told him was that of his wife. Without much prodding, Swift Runner revealed what had happened to the rest of his family. At first, Swift Runner became haunted by dreams. 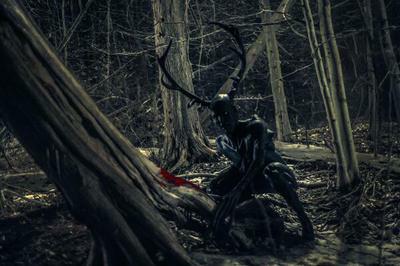 A Windigo spirit called on him to consume the people around him. The spirit crept through his mind, gradually taking control. Finally he was Windigo, and Swift Runner no longer. Then the Windigo killed and ate Swift Runner’s wife. The revolted Mounted Police party hauled Swift Runner and the mutilated evidence back to Fort Saskatchewan. The trial began on August 8, 1879. The judge and jury did not view the Windigo idea in the same light as the Cree. They saw Swift Runner as a murderer, and the trapper made no attempt to hide his guilt. Stipendiary Magistrate Richardson quickly sentenced him to be hanged. The sentence presented a problem: the police had never before conducted an execution. Although the Hudson’s Bay Company had once hanged an employee for murder, this was, for all intents and purposes, the first formal execution in western Canada. Staff Sergeant Fred Bagley, a force bugler, was put in charge of the arrangements. A gallows was erected within the fort enclosure at Fort Saskatchewan, and an old army pensioner named Rogers was made hangman. On the appointed morning, a bitterly cold December 20, Swift Runner was led to the scaffold. Standing over the trap, the unrepentant cannibal was given the opportunity to address the large crowd that had gathered. He openly acknowledged his guilt, and thanked his jailers for their kindness—then berated his guard for making him wait in the cold! Nowadays we view as psychosis what the Cree thought to be the work of a Windigo spirit. At one time, in the belt of parkland that borders the northern plains, it was far from being a rare phenomenon. Usually the symptoms were the same as those displayed by Swift Runner. And in one way or another, most of the afflicted Windigos met similar, violent death. It was pitch black and brutally cold when Swift Runner was led from his cell at Fort Saskatchewan jail to start his long, last walk toward the gallows that awaited outside in the swirling snow. Swift Runner, or Ka-Ki-Si-Kutchin, had been told to prepare for death, and seemed to have heeded the advice. He walked confidently into the yard, seeming much calmer than many of those who were there to watch him die. Most of the 60 people gathered near the gallows had never seen a hanging, and they were nervous and anxious about what was going to happen. Sheriff Edouard Richard had been delayed by the snow and weather, and was flustered by his late arrival at the fort. The hangman, too, appeared nervous. The execution had been ordered to take place at 7:30 a.m. on Dec. 20, 1879. With less than half an hour left to go, it was discovered that the crowd had taken the trap from the gallows and burned it as kindling, that the hangman had forgotten to bring straps to bind the prisoner's arms. As the sheriff and hangman rushed to get the scaffold ready again, Swift Runner sat near one of the fires that had been lighted nearby, joking and chatting, snacking on pemmican, the thick noose hanging loose around his neck. "I could kill myself with a tomahawk," he offered, "and save the hangman further trouble." Swift Runner was well-known around the Fort Saskatchewan settlement, a striking 6-foot-3, with a strapping build and what one policeman called "as ugly and evil-looking a face as I have ever seen." He had once been known as smart and trustworthy, a reputation that won him a job as a guide for the North West Mounted Police. But, as one newspaper story would later point out: "His contact with white men, however, ruined him." That ruination came, in part, from an inordinate fondness for the whisky that was smuggled into the area disguised as medicine. Swift Runner was known to be "an ugly customer to meet when on a spree," so ugly that some called him "the terror of the whole region." The police sent Swift Runner back to his tribe, where he caused so much trouble he "turned the Cree camps into little hells," and was eventually turned out from his community altogether, retreating to the wilderness with his wife, mother, brother and six children. The police started to hear stories in the spring. A Cree chief said Swift Runner had "turned cannibal," and a hunter reported that Swift Runner's entire family had been killed in the woods, but a squad of officers who went out to investigate couldn't find Swift Runner or his family. Instead, Swift Runner went to the police himself in the spring, telling them his wife had committed suicide and the rest of the family had died of starvation. But the officers noticed that Swift Runner didn't look underfed. "The prisoner arrived at our camp in the spring and did not look very poor or thin or as if he had been starving," one noted. Suspicious of the story, police travelled with Swift Runner to his family's camp in the wilderness north of Fort Saskatchewan. 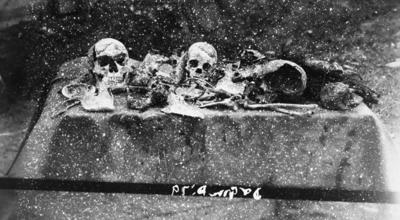 After days of searching, they found the remnants of a campfire, with piles of bones and human skulls scattered nearby. Some of the bones were dry and hollow, empty even of marrow. A small moccasin had been stuffed inside the skull of Swift Runner's mother, a beading needle still sticking out of the unfinished work. Swift Runner was tried for murder and cannibalism by a jury that included three "English speaking Cree half-breeds," four men "well up in the Cree language," and a Cree man who translated the proceedings. A leading Cree/English scholar was also brought in to observe the trial and ensure Swift Runner knew what was being said. Swift Runner sat calmly throughout the testimony of witnesses, who described the family being in perfect health when they headed out to the woods, then Swift Runner coming out of the forest alone. There was no evidence presented in Swift Runner's defiance. Asked if he wanted to say anything, he responded: "I did it." Some said Swift Runner had developed a taste for cannibalism years earlier, when he was forced to eat the remains of a starved hunting partner to save himself. Others said he had been possessed by the Windigo, a flesheating spirit that tormented him and gave him nightmares. Two hours after Swift Runner was led to the gallows, the execution was finally ready to proceed. He was allowed to eat one final pound of pemmican before he was pinioned tightly with rope and taken to the scaffold, where a thick, black hood was placed over his head. "Just before the trap fell, Swift Runner said, "I am no longer a man." and Swift Runner went down with fearful force, there being a drop of five feet," the Daily Evening Mercury reported. "He died without a struggle. The body was cut down in an hour and buried in the snow outside the fort."